On the up: Hollister were crowned League Two champions last weekend after a 2-1 win over Ballina United. Photo: Mayo League. With two rounds of games left in the top flight the battle to avoid the drop is the big issue still at play - Iorras Aontaithe have already been relegated back down to the Premier Division for next season, having picked up just two wins in their 16 games to date. This weekend the north Mayo men have the potential of bringing Ballyheane down with them if they manage to pick up a third win of the season and Kiltimagh-Knock United can pick up a positive result in their outing against Claremorris at home. Both of those games will kick off at 2.30pm on Sunday. The east Mayo side will go into their meeting with Claremorris on the back of a 3-1 win over Iorras that confirmed their relegation thanks to goals from Jan Lapour and a Liam Groarke brace. Ballyheane were held to a 1-1 draw by Ballyglass, with a Jack Tuffy penalty putting them 1-0 up early on before Janius Mockus levelled it up before the break. But all is not lost for the Quigley Park outfit if they manage to pick up a win this weekend and if Kiltimagh-Knock United don't it will set them up for a final day game against Kiltimagh-Knock United at home, with the winner to take all and the loser tumbling out of the division. At the top of the table, Ballina picked up win number 14 with a 4-2 win over Straide and Foxford United, but behind them the battle for second place shifted in Westport United's favour with a 2-0 win over Castlebar Celtic in United Park. Goals from Mark McDonagh and Jack Murphy, did it for United who moved six points clear of Celtic. This weekend they will be away to newly crowned champions, Ballina Town, where a win or draw will wrap up second spot for them, before the final round of league games next month. Claremorris moved level with Celtic on points last weekend after they saw off Manulla 3-0, thanks to goals from Danny Broderick, Simon Butler and Ronan Commons. In the Premier Division, Snugboro United's promotion was confirmed despite going down 2-1 to seventh place Bangor Hibs on Sunday; Their promotion was sealed before they played - but manager Aaron Curry will be disappointed they let slip the chance to wrap up the title . They will have another chance to wrap it up this weekend when they go away to second placed Ballyhaunis Town. The east Mayo men who are four points behind the Boro' at the minute and just four ahead of Swinford in third, with two games to go - also went down to a surprise defeat last weekend when they were held to a 2-2 draw by Fahy Rovers on Saturday night. At the bottom of the table Wesport United B have already been relegated, but just ahead of them Ballyglass B could be about to join them this weekend, unless results go their way on Sunday. They are away to Glenhest Rovers, while Conn Rangers who sit six points clear of them at the minute, are away to an Achill Rovers side who have nothing really to play for. 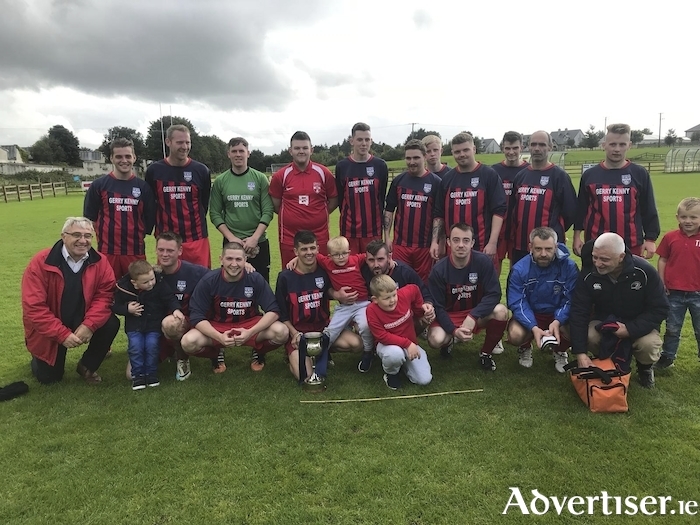 The action in the bottom two divisions has now concluded in League Two and Hollister were crowned champions after a 2-1 win over Ballina United last weekend. The north Mayo men just edged Claremorris B out to claim the title by a point after that victory. Vinny Coen's men picked up the clubs' first ever league title thanks to the win, with Daniel Langdon and Tony Loftus goals. The Mayo League awards for August was announced this week and the winners of the team of the month is Ballyhaunis Town - the east Mayo outfit currently sit in second place in the Premier League and look on course for promotion to the top flight. There was double celebration for the club with Gary Higgins also being named as the Premier Division player of the month. The manager of the month award went to the Ballian Town B joint management ticket of John Conway and Philip Devers who guided their side to the League One title and promotion to the Premier Division for next season. The other divisional player of the month awards went to Manulla's Jackson deSilva for the Super League, Jack Muldoon from Ballina Town B in League One and Claremorris B's Niall Kitching in League Two. The young player of the month went to Conn Rangers' Eoin Prendergast.